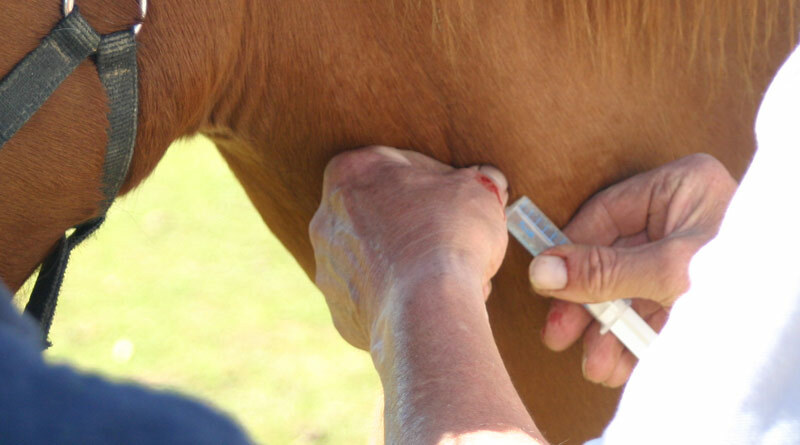 Blood being drawn from a horse for making diptheria antitoxin, on a farm in India. Horses being used in the production of diptheria antitoxins may soon be a thing of the past, with funding of ground-breaking research being provided by Animal advocacy group PETA’s International Science Consortium. The consortium has provided €134,000 to the Institute of Biochemistry, Biotechnology, and Bioinformatics at the Technische Universität Braunschweig in Germany, based on lead researcher Prof Michael Hust’s expertise in the development of human antitoxins. Diphtheria is a serious illness bacterial disease primarily infecting the pharynx, larynx, tonsils and nose. It can cause difficulty breathing and severe damage to the kidneys, nervous system, and heart. In 2013, 4700 cases were officially reported, down from nearly 100,000 in 1980. It currently occurs most often in Sub-Saharan Africa, India, and Indonesia. In 2013, it resulted in 3300 deaths down from 8000 deaths in 1990. Death occurs in between 5% and 10% of those affected. The disease was first described in the 5th century BC by Hippocrates. The bacterium was discovered in 1882 by Edwin Klebs. Each year, thousands of horses are used to produce antitoxins. These antitoxins are isolated from horses’ blood after repeatedly injecting them with toxins, including diphtheria toxin. Many of these horses are kept on farms in India. Antitoxins made from the blood of horses on these farms are exported and used worldwide. In addition to addressing the ethical concerns of producing antitoxins in horses, the development of this and other recombinant human antitoxins is critical to avoiding the serum sickness that horse-derived antitoxins can cause in humans, as well as to mitigating the global shortage of diphtheria antitoxin. This research will lead to the development of recombinant human antibodies that can block the illness-causing diphtheria toxin and also be produced in the laboratory without horses. “This project is a much-needed step towards replacing the use of animals with non-animal technologies that can produce safer and more effective human medicines,” said molecular biologist and Consortium associate director Dr Amy Clippinger. The PETA International Science Consortium Ltd was established in 2012 to fund and accelerate the development, validation, and global implementation of alternatives to testing on animals.